Expert Andrey Lankov explains why, even though international media has been clamoring about the potential for war on the Korean Peninsula, the reality of the situation is quite different. According to him, there are two reasons that explain North Korea’s recent outburst of bellicose language and South Korea’s apparent unconcern. If the world media is to be believed, the Korean Peninsula is now on the brink of war. Indeed, over the last few days the North Korean government has been pumping out seriously bellicose rhetoric. Specifically, North Korea stated that it would withdraw from the Armistice treaty on Mar. 11 and cut the phone hot-line between Pyongyang and Seoul; it is withdrawing from its non-aggression pact with South Korea, as well. Meanwhile, the Rodong Sinmun (the mouthpiece of the North Korean government) ran an editorial in which it stated that the glorious North Korean army, newly equipped with the world-class nuclear weapons and missiles, will transform both Seoul and Washington in seas of fire — presumably as soon as the Supreme Commander gets around to giving the relevant order. According to reports from North Korea, the populations of major cities are undergoing frequent, high-intensity, air-raid drills. The international community is worried, to be sure; some media outlets have begun to dispatch their correspondents to Seoul, on the assumption that a conflict might breakout very soon. These media companies are likely to be wasting their money, though. The likelihood of any confrontation — let alone a war — in Korea remains pretty low. What we are seeing now is just another round of political manipulation by Pyongyang. The show of menacing bellicosity is a performance, aimed at both the foreign and domestic audience. The reason for this calm is simple: South Koreans have seen this many, many times before. As a matter of fact, they see such histrionics as often as once every year or two. North Korea has claimed that the 1953 Armistice is null and void on a number of occasions in the past. The last time such statements were made was in May 2009, as a part of reaction against an earlier U.N. resolution which, like this recent one, condemned a nuclear test. As for the recent promise to transform Seoul into a “sea of fire,” it has also been repeated a number of times. It was first used in 1994 and repeated in 2003. The North Korean media has sometimes not limited itself to such general threats, but become very specific about their supposed targets. For example, in July 2012, the North Korean official media threatened to blow up the headquarters of major South Korean newspapers that had published articles and materials not to Pyongyang’s liking. Nothing has happened to the newspapers headquarters, or, for that matter, the South Korean capital itself. As earlier experience shows, North Korea has never made good on its vocal threats, so the South Korean public is, in all likelihood, correct when taking another Pyongyang broadside very lightly. Still, if this is the case, why is all of this done? 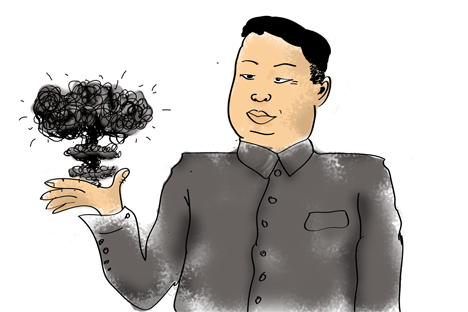 There seems to be at least two reasons behind Pyongyang’s noisy behavior. First, this rhetoric seems to have become a standard reaction to U.N. Security Council resolutions that condemn the nuclear and missile developments in the North. In spite of its high pitch, this is, first and foremost, a diplomatic gesture — a way to express North Korea’s dissatisfaction with the resolution, as well as its resolute unwillingness to bow to outside pressure. The second reason behind these outbursts of verbal bellicosity is that the North Korean populace has to be regularly reminded about their country being surrounded by scheming enemies. Otherwise, they might start asking politically dangerous questions: for example, they might wonder why their country, once the most industrially advanced in all of continental East Asia, is increasingly lagging behind China and (especially) South Korea. Outside threats are the best way to explain away never-ending economic difficulties, and an air-raid drill or two does wonders when it comes to keeping people afraid and stopping them from having heretical thoughts. It also reminds North Koreans of the need to maintain discipline and unite around the current leader and his “glorious” family. It therefore appears that the world has somewhat overreacted to the North Korean rhetoric. This does not mean that the Korean Peninsula is a peaceful place. On the contrary, as decades of experience teaches us, we can be pretty sure that, from time to time some, clashes of a relatively small scale are bound to happen on the land and sea borders between the two Koreas. However, the chances of such clashes are low right now. The noise emanating from Pyongyang is, well, just noise. Andrey Lankov is a Russian scholar of Asia and a specialist in Korean studies.